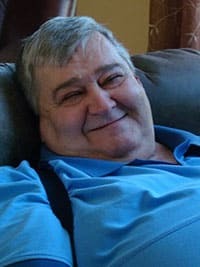 Lawrence Alberic Monette - Edmonton's Burial & Cremation Professionals | Trinity Funeral Home Ltd.
On Friday October 19th, 2018 Lawrence Alberic Monette passed away at the age of 68 years. He is survived by Diana Monette, his loving wife of 40 years. His sisters Dorine Logan and Vivian Aldana and his brothers, Michael and Andrew (Aimee) Monette, sister-in-law Bev (Wes) Coleman, brothers-in-law, Denis Matwychuk, Joe (Sandi) Matwychuk-Goodman and George Matwychuk. Nieces (5), nephews (19), great-nieces (15), and great-nephews (10). We will all miss you. May you rest in peace now that your pain is gone. Our sincere condolences to you Diana. We enjoyed both of your company in Yuma. My sincere condolences Diana and to the Monette family. You’re in my thoughts and prayers. Lawrence will be missed by all who were blessed to spend time with him. My sincere sympathies Diane and the Monette family. Diana we are saddened by your loss. Our sincere condolences. We loved Lawrence and will remember him in our prayers. Our deepest sympathies Diana during this difficult time, we really enjoy meeting & spending time with you two in Yuma. Our sincere condolences, Diana! May you find solace in your fondest memories of Lawrence. So sorry for your loss, thinking of you and your families at this very difficult time. He will be remembered fondly by all who knew him. Our most sincere condolences Diana. We are sorry to hear about Lawrence ‘s passing Diana. Our Dee and most sincere condolences to you. We are so very sorry to hear about Lawrence’s passing Diana. Please know that you and your family are in our thoughts and prayers. Our deepest and most sincere condolences to you. We are so very sorry to hear about your dear Lawrence. He was a good man and we will all miss him. You are in our thoughts and prayers. Our deepest condolences to Diana and the Family. We got to know Lawrence and greatly enjoyed his company. A great friend and above all a real gentleman. He will be missed by all. Our deepest sympathy Diana and all the family.💕 Lawrence will surely be missed by all who knew him. A man among men that stood out for his thoughtfulness of others no matter what. He stood his ground and did it his way. Love u and will miss u. We are so sorry on Lawrence’s passing. You and your family are in our thoughts and heart.